ICBM test not related to actions in Ukraine, says both Russian Defense Ministry and U.S. officials. 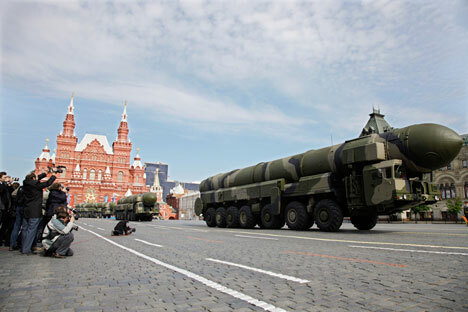 On the evening of March 4, Russia’s Ministry of Defense announced that Strategic Missile Troops had launched a RS-12M Topol intercontinental ballistic missile (ICBM) from the Kapustin Yar test site and that the missile had hit its designated target in the Sary Shagan test site in the Republic of Kazakhstan. “The launch was conducted in order to test potential military equipment of intercontinental ballistic missiles,” said Ministry of Defense spokesman Igor Yegorov. The Topol RS-12M system is a three-stage solid propellant intercontinental ballistic missile that is equipped with missile penetration aids. The Topol stands out for high durability due to its mobility, security and short launch preparation time. The missile’s maximum flight range is 6,500 miles and its gross lift-off weight is 45 tons. Although the missile did not carry an explosive device, foreign observers noted the test and speculated that it was connected to Russia’s intervention in Ukraine. Ministry of Defense statements sought to explain that the test was simply to an ordinary test. Outwardly, the missile is an exact copy of a warhead. In terms of shape, weight and equipment, it is identical to actual ammunition. During such test launches, the designers and military are first and foremost interested in how the entire filling obeys ground command, how precisely it delivers the flight parameters and completes the tests, and ultimately, how effective it would be in a real deployment. According to an official statement by the Ministry of Defense, the launch was conducted in the interests of the Strategic Missile Troops and the navy. As for the navy, these tests are important for naval commanders to assess the potential of the new Bulava 30 strategic submarine system. Promising military equipment for its missiles can also be tested with the Topol. During such launches, the carrier itself is also tested. Its life cycle has been continually extended and is now up to 25 years. The first Topol regiment was launched in a combat alert mission on July 23, 1985. Now, this modernized missile system is the foundation of the force of the Strategic Missile Troops. When the missile’s life span is near its end, it is either removed from military duty or taken from the warehouses and launched toward Kapustin Yar or Plesetsk. In this way, an old carrier helps to test a new warhead and save money on missile use. The Strategic Missile Troops generally perform the launches from two sites: either from Plesetsk to the Kura test range in Kamchatka or from Kapustin Yar to Sary Shagan. The choice depends on what the designers and generals need to discover. If they need to check the effectiveness of the entire ammunition, they send it on a long range to the Far Eastern site. When they are testing a new warhead, the Astrakhan site is more suitable. The Ministry of Defense asserts that Kapustin Yar is unique due to its testing ranges and the launch-site data acquisition and measurements system. The Strategic Offensive Arms Treaty prohibits placing new military equipment on old Topol carriers. According to the agreement with the United States, the RS-12M missile on alert cannot separate. But there is no prohibition against using the carrier as a distinctive simulator for tests of warheads for other missiles, so from the perspective of international obligations, Russia is fully in compliance. Konstantin Sivkov, president of the Academy of Geopolitical Issues in Moscow agreed that the test was simply routine.